As I sit on the riverside in Tha Ton the sky is hazy and small pieces of black ash fall from the sky all around me. 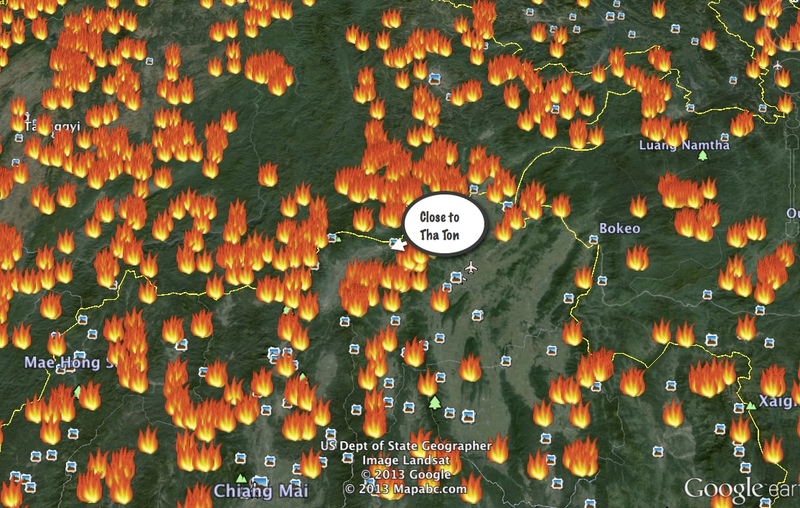 The controversial burning season is an annual occurrence all over South East Asia. 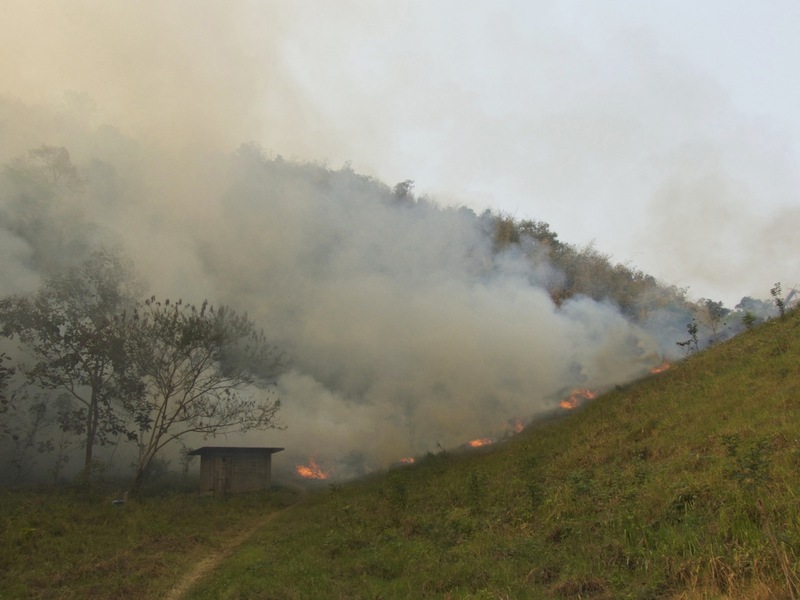 Most of the expats we have met here find a way to leave during late March and April when the local hill tribes and thai farmers cut down the vegetation on the hillsides and light it on fire. We wonder frequently about our decision to stay here during this time as our eyes burn and breathing becomes increasingly difficult. Each day the skies fill with smoke and what might have been beautiful views become obstructed with a thick haze. 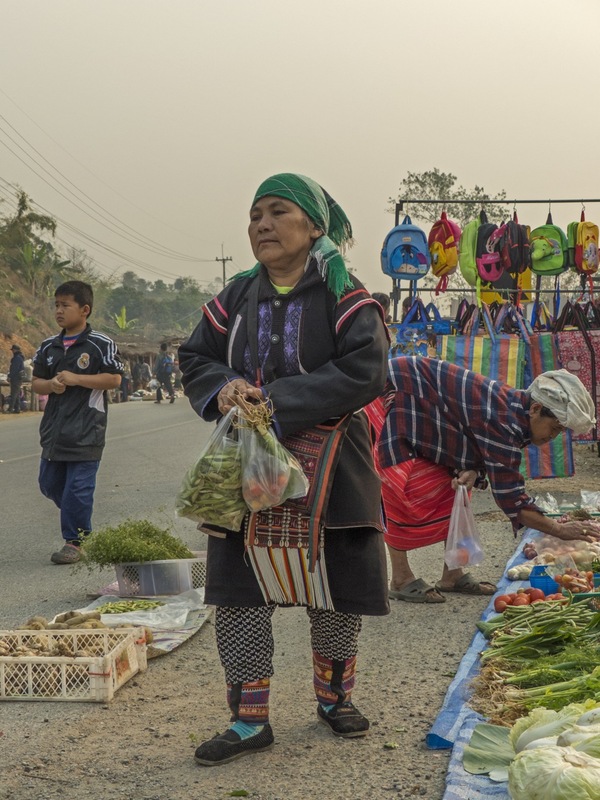 Tha Ton is a small town in the northwest corner of Thailand nestled at the base of lush green mountains that connect Thailand to Burma. 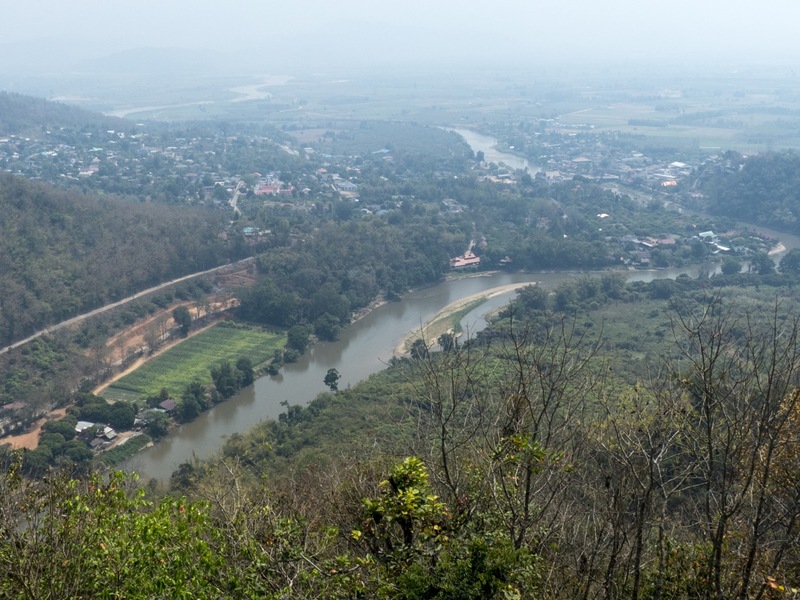 The Kok river flows through the center of town and then out into a large valley covered by orchards and rice paddies. There are only a few places we’ve stopped along the road where I can imagine living for a while and this is one of them. It’s very quiet and the people are all very kind. We are staying in a newer guesthouse called Sappaya. Our large room looks out over the river. Suni, the owner, has made sure we have everything we need. 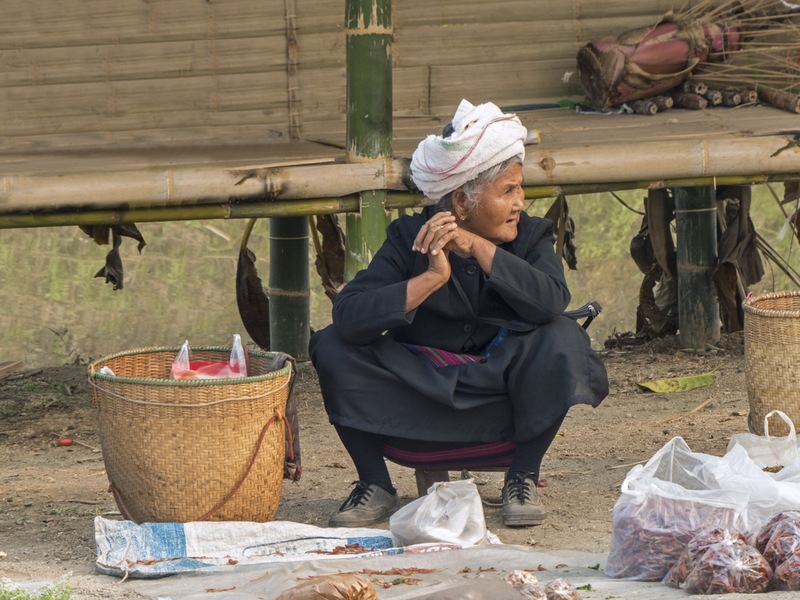 There is a woman down the road at Sunshine cafe who cooks excellent food and a hut next door that serves one of the best noodle soups in Thailand. 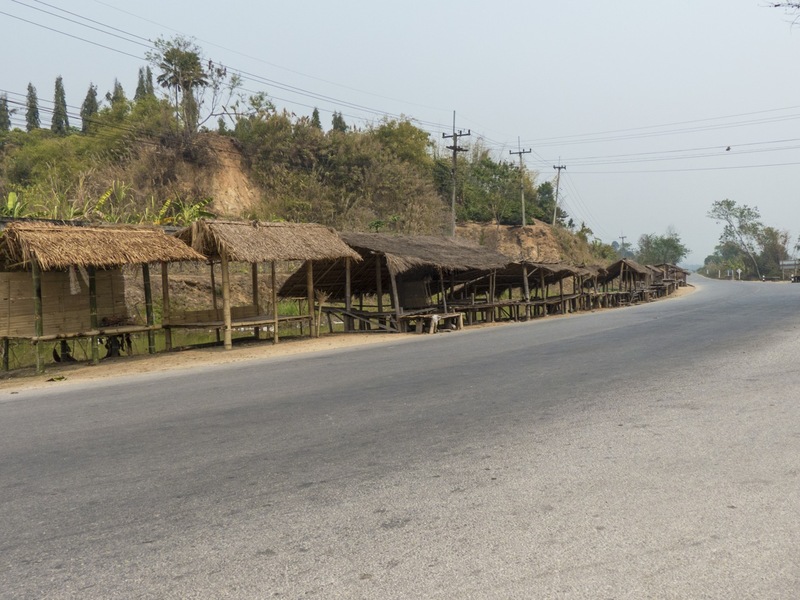 A few kilometers away from our guesthouse is a road the could takes us over the border and into Burma but there is no international immigration post there. 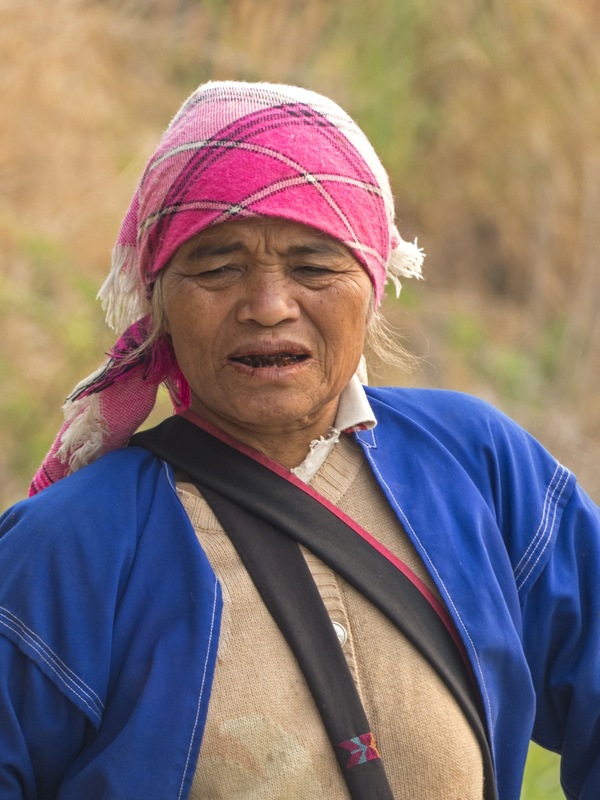 The close proximity to Burma may be the reason we have found so many different Hill Tribes in this area. Many of them fled here during the ethnic cleansing in Burma and currently live in Thailand without legal status in any country. Education and other civil services are not provided to them by the Thai government. Most live in poverty. 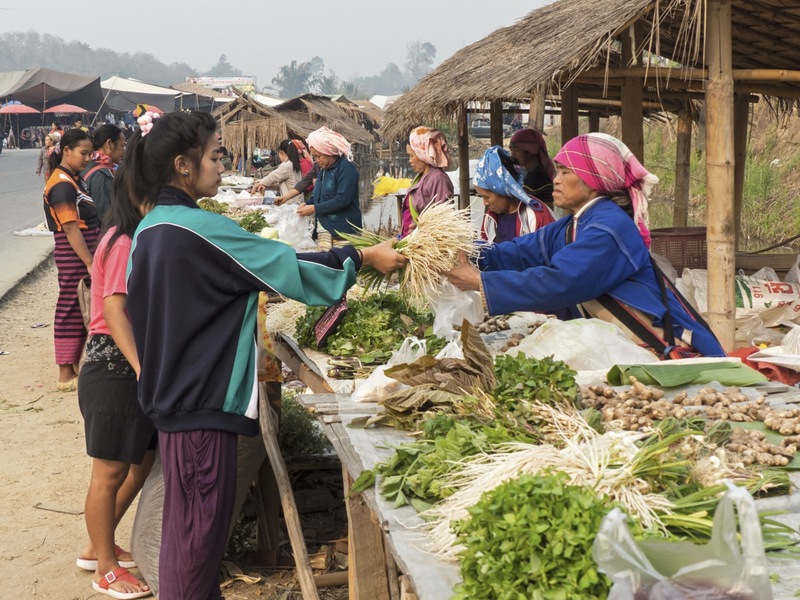 We had read about a Tuesday market that happens 15 kilometers from Tha Ton each week. We arrived by boat on Monday and were set to leave early in the morning for the market. Tha Ton is not setup well for renting motorbikes. There is only one place in town and their motorbikes cost 400 baht per day. For comparison, we paid 140 in Pai.. Some delays getting the bike rental arranged caused us a late start so, with me gritting my teeth all the way, Michel drove at 70 kilometers an hour to get to the market before it was over. We arrived in time fortunately and found one of the best mixes of Ethnic Minorities we have ever seen. 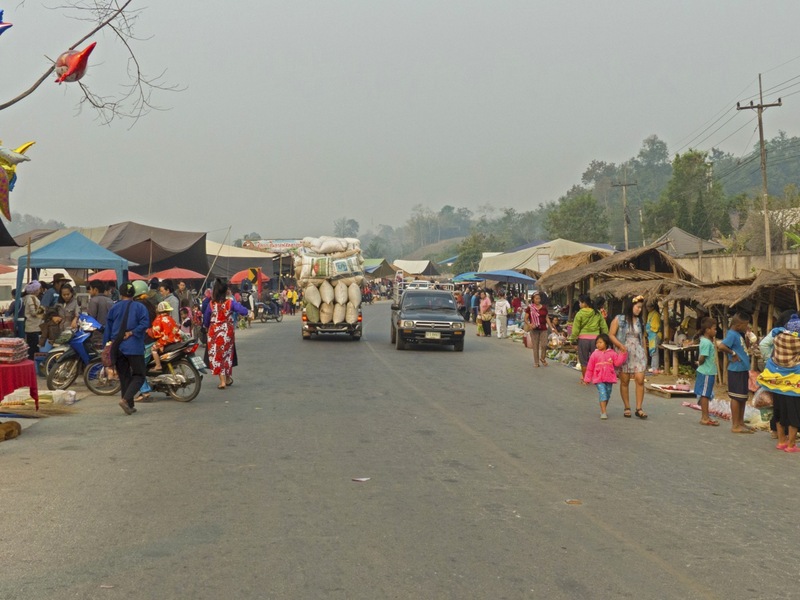 The market is setup on two sides of the main road. 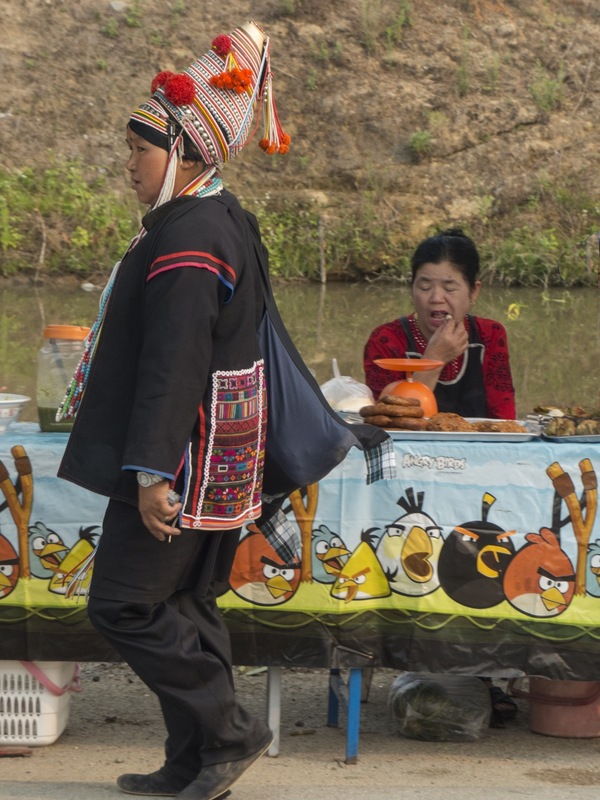 This market is where the locals come to sell their fresh foods and wares to each other. 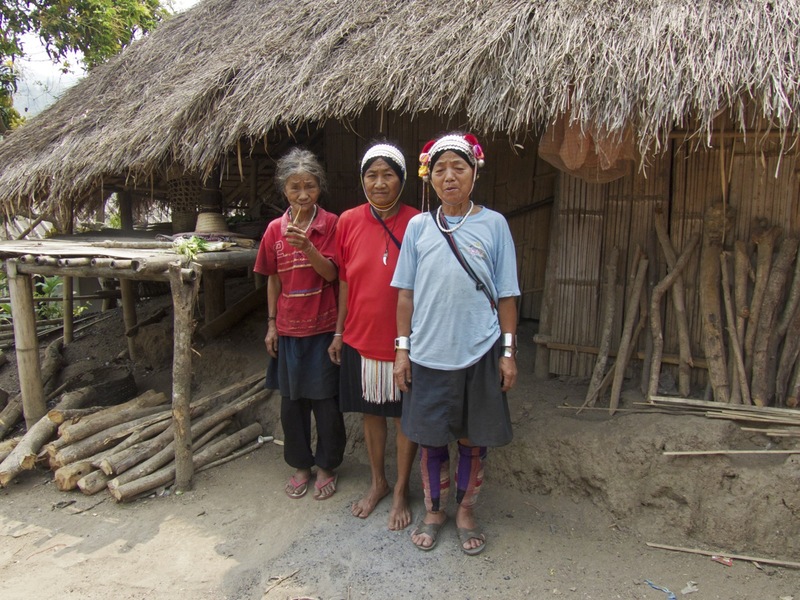 We met this group of Palong Long Neck women almost immediately. They were all smiles and very friendly, not minding having their pictures taken at all. 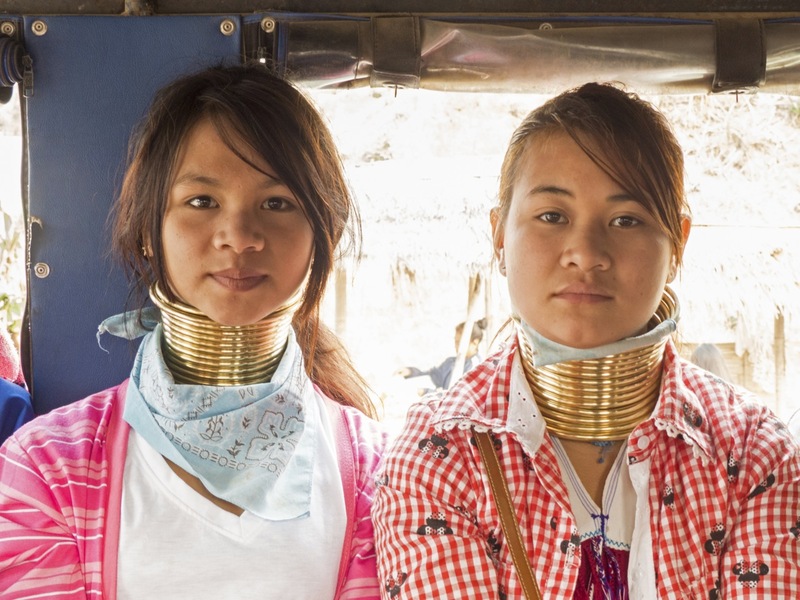 The women start wearing these rings around their necks very young which eventually force their necks to stretch. We had heard rumors that this causes problems and that eventually they cannot remove them but further research shows this to be untrue. The rings are removed and cleaned on a regular basis with no issues although I imagine there must be some discomfort and potential strain to muscle along the way. The women wear the rings for beauty and these girls were certainly all very lovely. We were the only farang at the market and the friendly people smiled and nodded as we walked around. 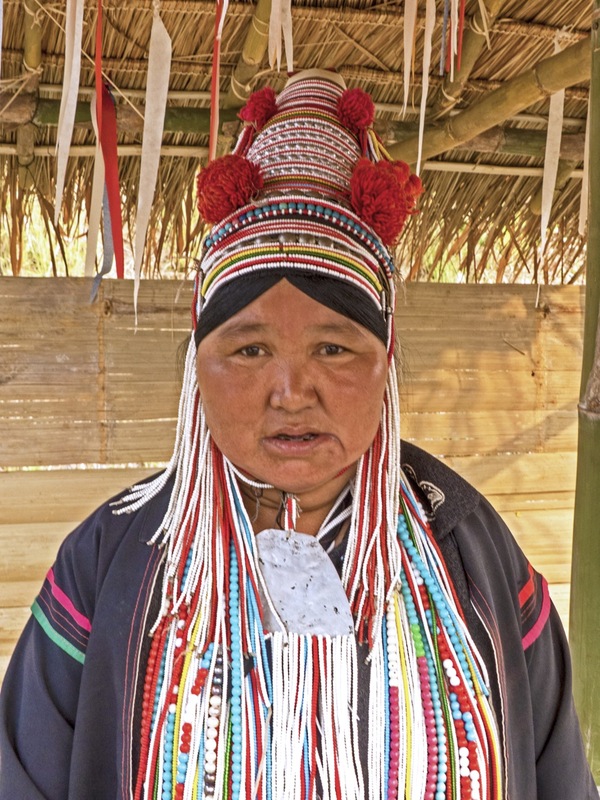 The costumes of the Akha women were unmistakeable. 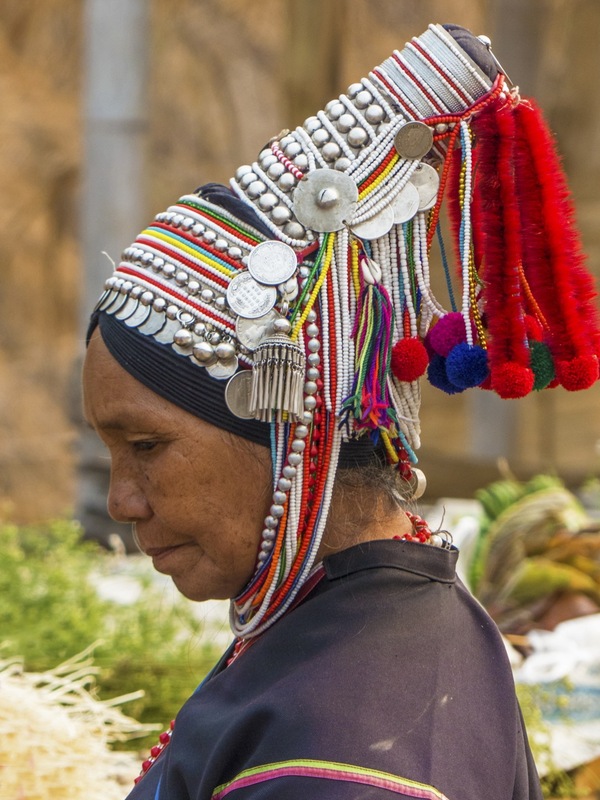 Each headdress is made by the woman who wears it. 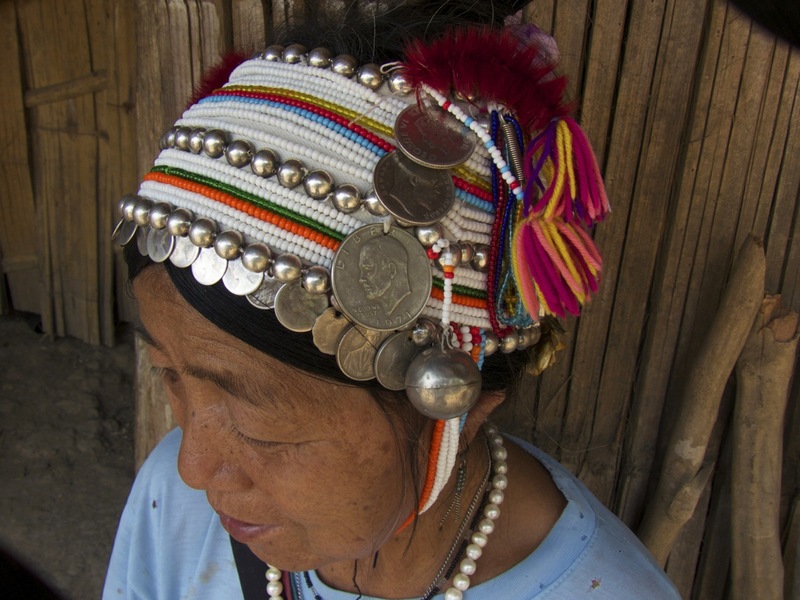 They are covered with beads and coins. 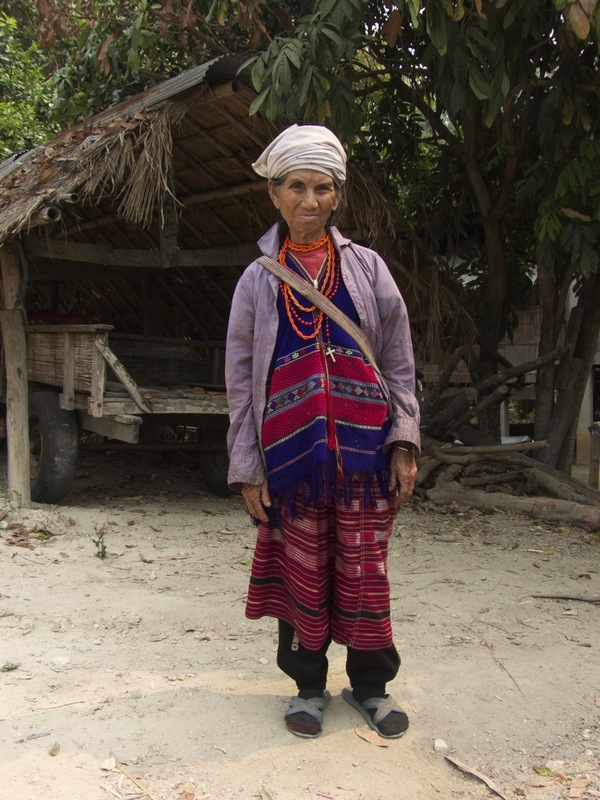 The Lahu women also wear distinctive clothing. This particular group are wearing the white turban and dark colored jacket and skirt. 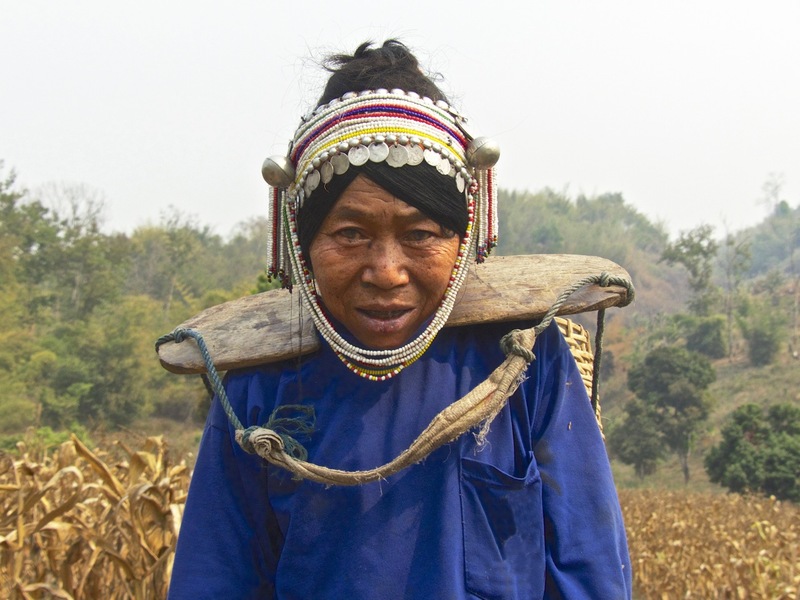 snip it on the Lahu: Although primarily subsistence farmers, growing rice and corn for their own consumption, the Lahu are also proud of their hunter-warrior heritage. They remain a strict, serious people governed by strong principles of right and wrong, every individual in the village answering to the common will of the elders. 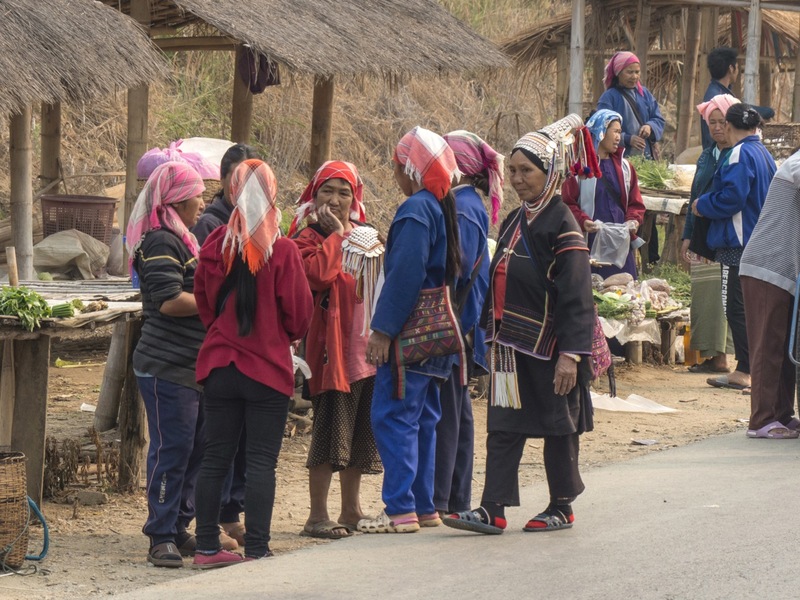 While less importance is placed on the extended family than in other hill tribe communities, the Lahu are still strongly committed to principles of unity and working together for survival. Lahus may have the most gender-equitable society in the world. 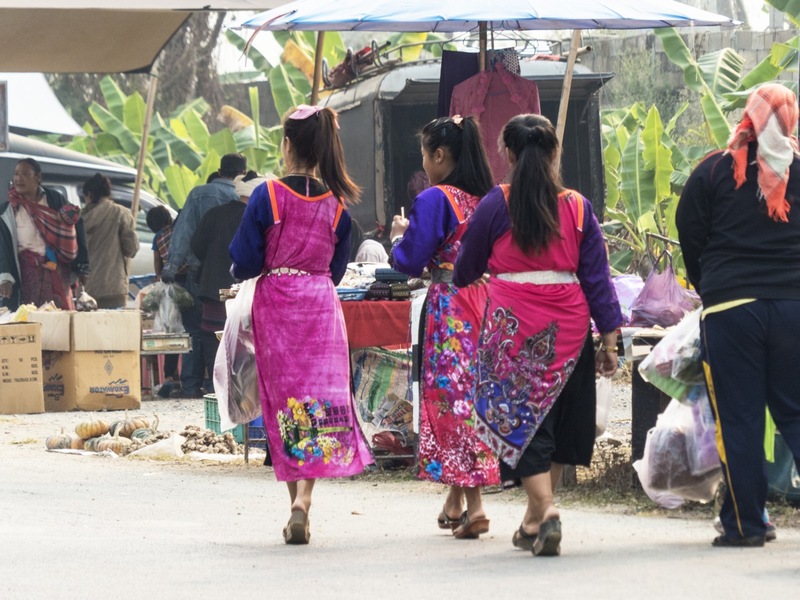 The Lisu appeared to outnumber the other tribes at the market that day. Many were clothed in reds and pinks over velveteen skirts. 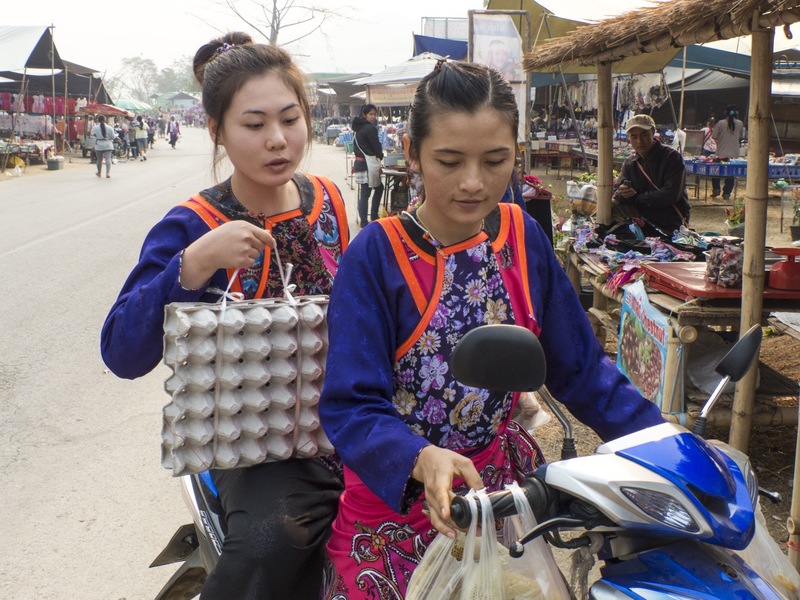 These young girls purchased their groceries, including the eggs that they will easily carry back home on the motorbike. 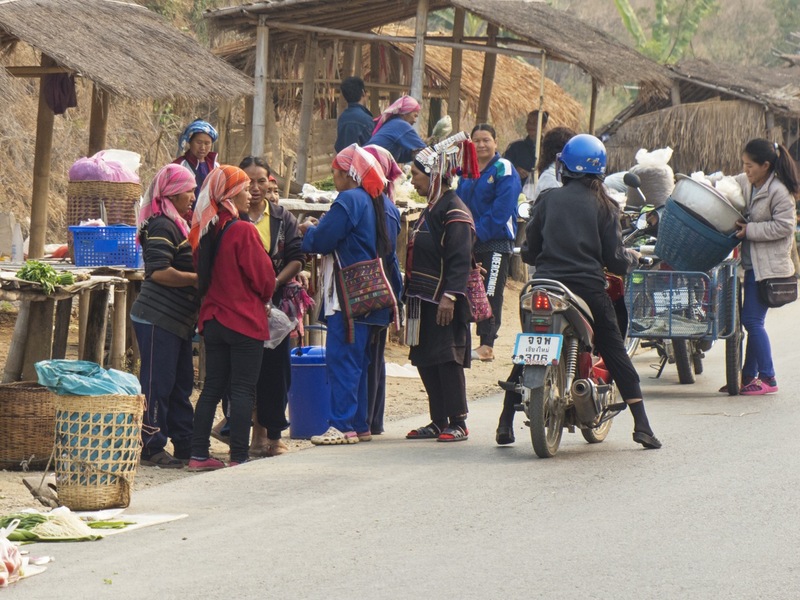 It is amazing to watch the local people’s balance on the bikes. They are mostly born to it, it seems, as I have seen enfants and young children balance easily. The hustle and bustle of the market continued around us. A traveling monk passed through and bestowed his blessings on any who wanted them. The women of the tribes congregated here and there to compare purchases and chat. 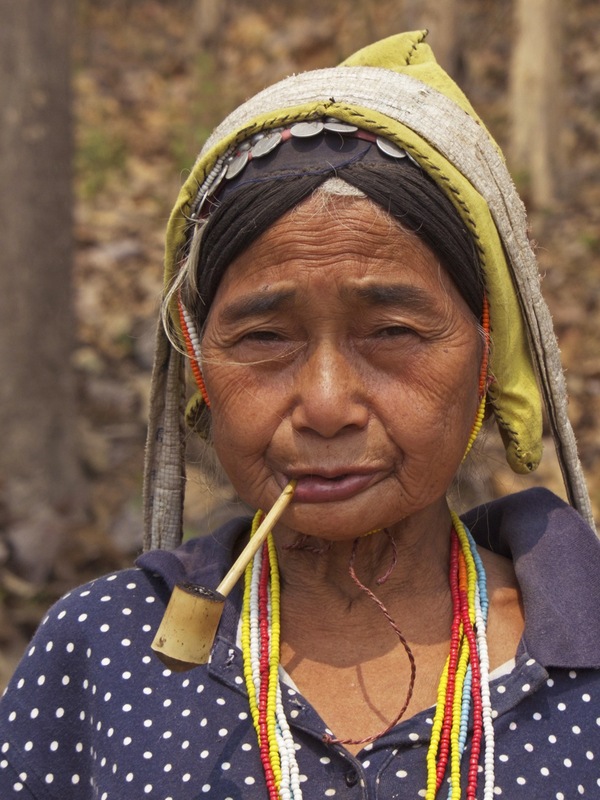 This woman partially displays her lips and teeth stained dark red brown with betel nut juice. 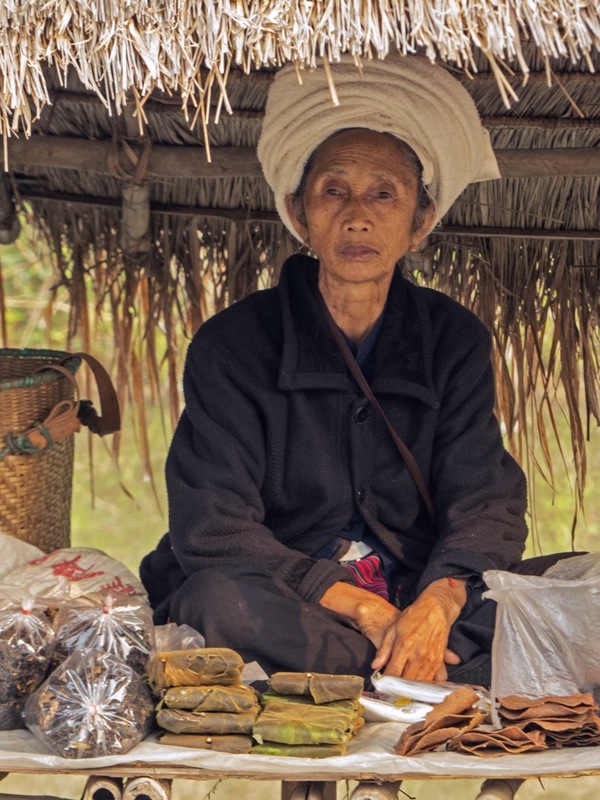 We have heard the the dark lips and teeth are also considered beautiful although betel nut juice is also a stimulant. This woman proudly displays her large ear lobes which have been stretched over metal rings. Funny the wide variety of ways we humans mutilate ourselves in the name of beauty. Red lips and pierced ears are considered beautiful in western society as well. These thoughts make me chuckle as I remember days growing up when my Dad would compare his two teenage girls begging for cosmetics and ear piercings to tribal women in Africa. 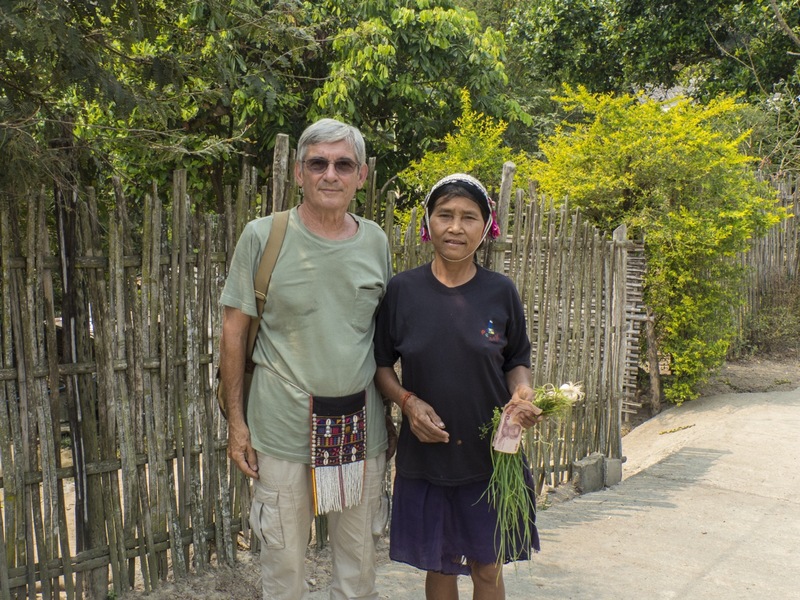 As the vendors at the market packed up their wares and drove away, Michel and I jumped back on the motorcycle and headed down the road a bit. As usual whenever Michel saw a potential photograph he was off the bike and chasing it down. 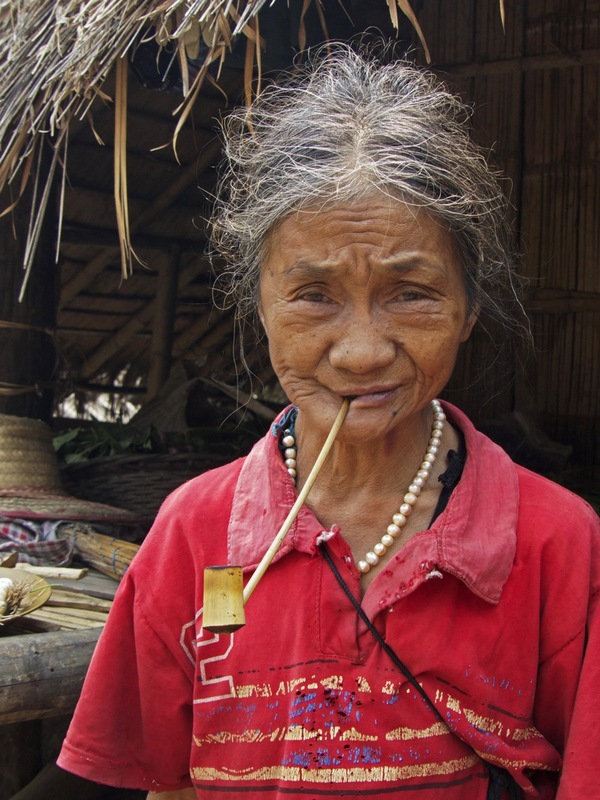 This Karen woman wanted to sell something to Michel and invited us into her home; a very rough one room wooden house on stilts. 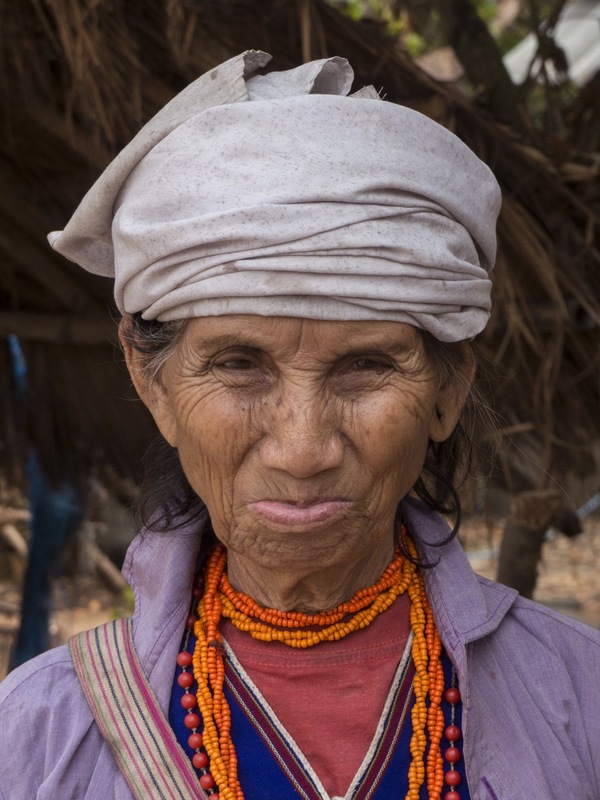 The Karen tribes in this area have mainly converted to Catholicism. Further down the road we encountered these woman walking up a hill off the main road. 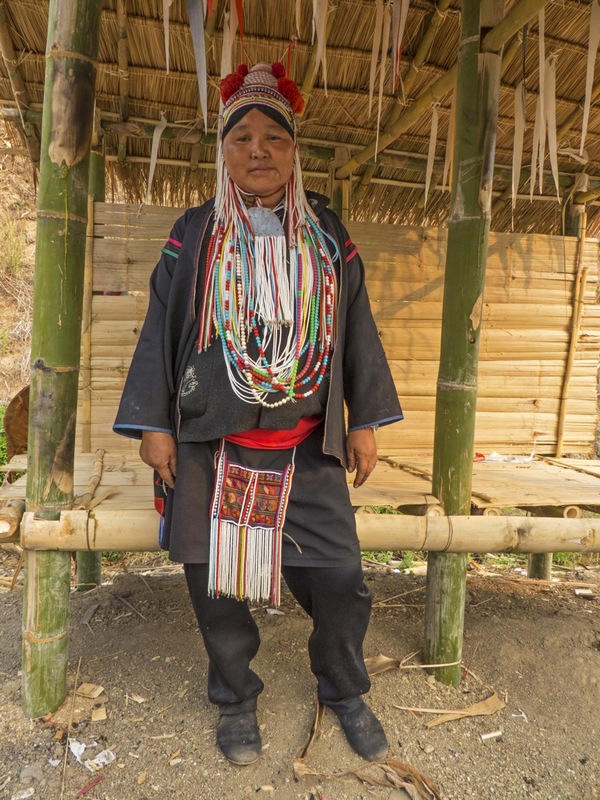 After Michel convinced her to let him photograph her she headed into an Akha village. 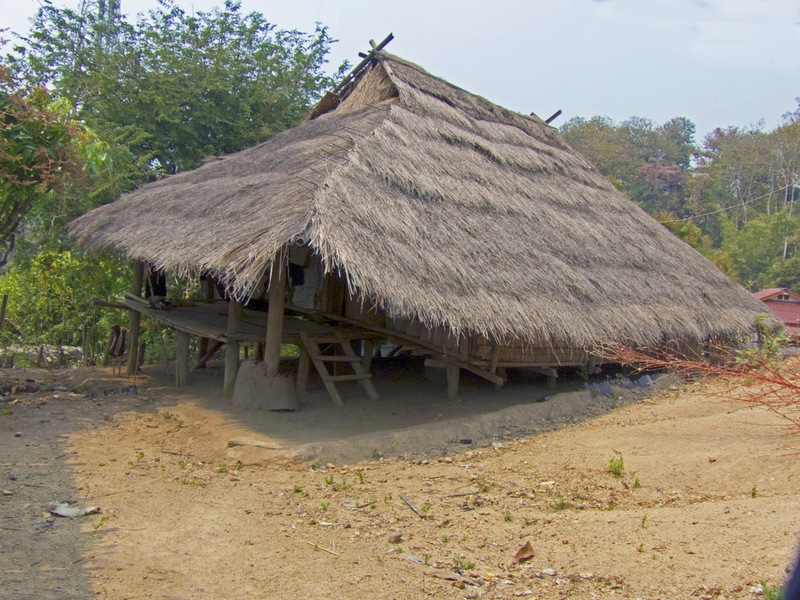 The village was predominately thatched roofs and bamboo huts. The village was clean and tidy. 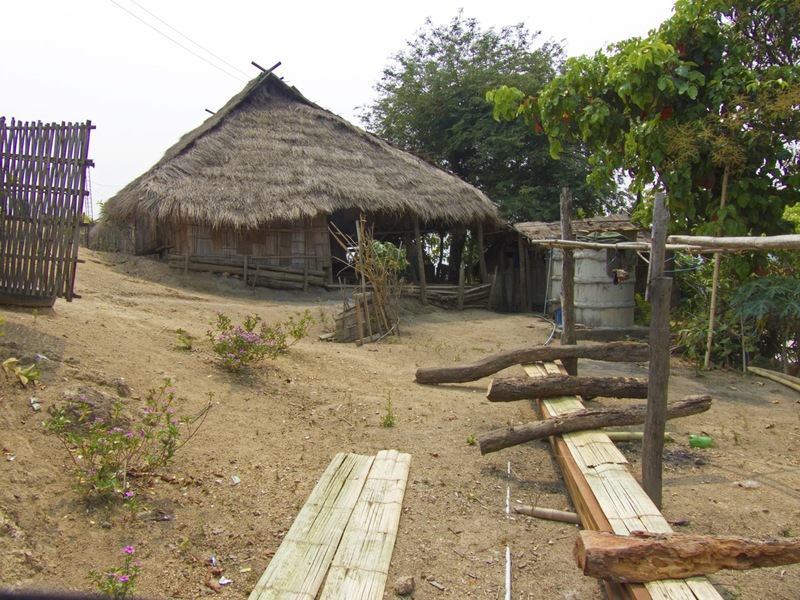 All of the huts were built into the slope of the hill. 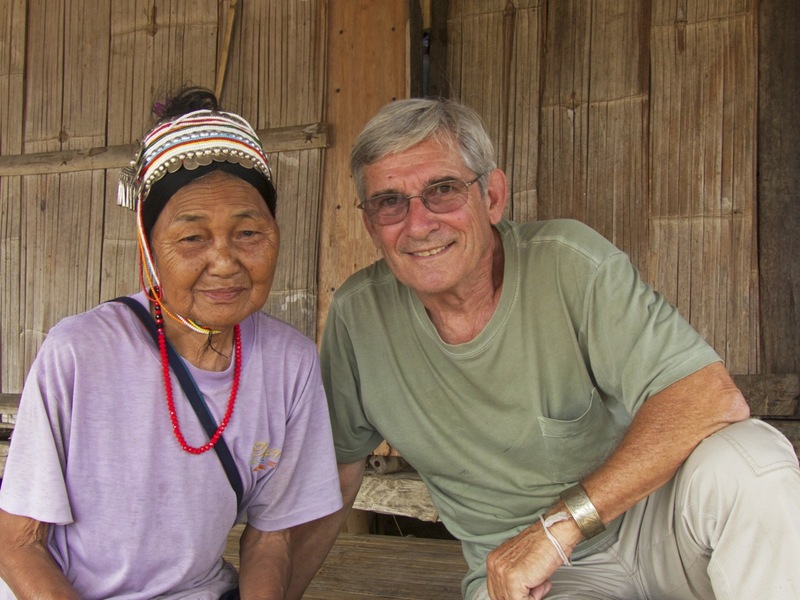 Michel saw a group of women sitting together in the village and began to interact with them. They were all laughter as they tried to convince him to give them some money. They would pat his pocket and point at their hands. He convinced them to pose for several pictures. He was able to closely examine the elaborate headdress of one of the women. Even though we did not speak her language she understood when he pointed out the Indian Rupees and US coins she had woven into it. Michel and the 3 Ahka women laughed together through all of their interactions. Everyone had fun! 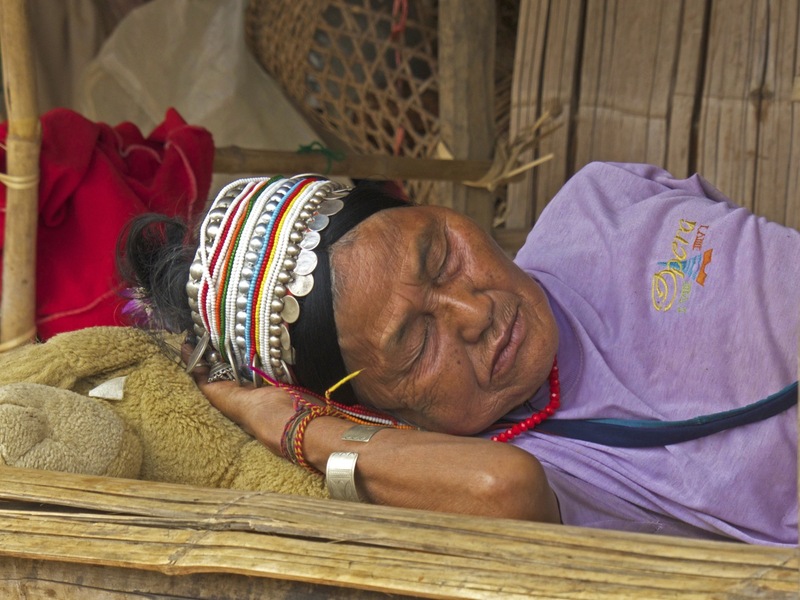 A little further into the village we passed this beautiful woman sleeping on her porch. Michel started to photograph her and she woke up. Still half asleep and slightly irritated she started to shoo him away. But in usual Michel style, he began to interact with her and she soon was smiling and inviting him on to her porch. Once there she removed her bracelet and placed it on his arm. She laughingly insisted he buy the bracelet for 100 baht. We were happy to give it to her as we knew she was poor and this money would go directly to her family. This woman too asked us to buy her belt. She signed that she had made it when her first child was born. We were both hesitant to take anything so precious from her but she insisted by removing the belt and putting it onto Michel. Once again, we felt this was good as the money was going directly to her and her family. So often these women only see a small part of the monies collected for the things they make. 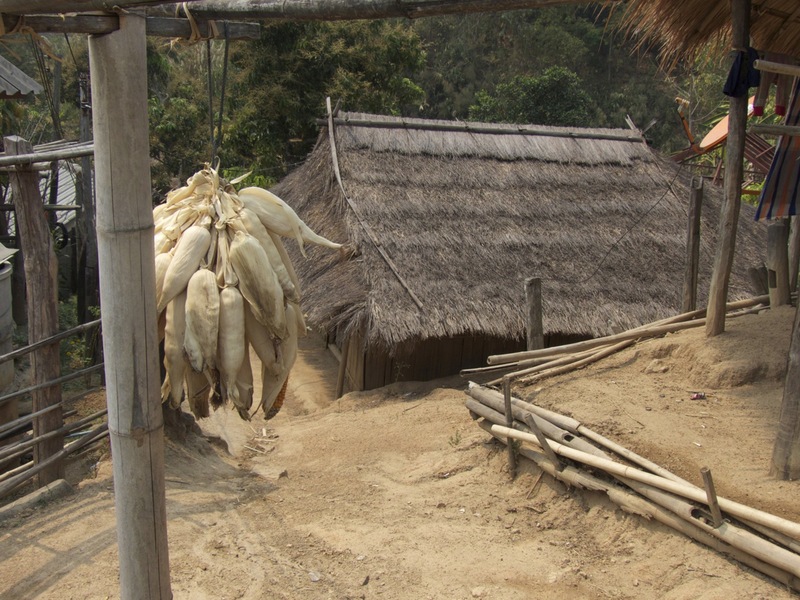 During our stay in South East Asia we have always search for villages like the ones we found near Tha Ton. 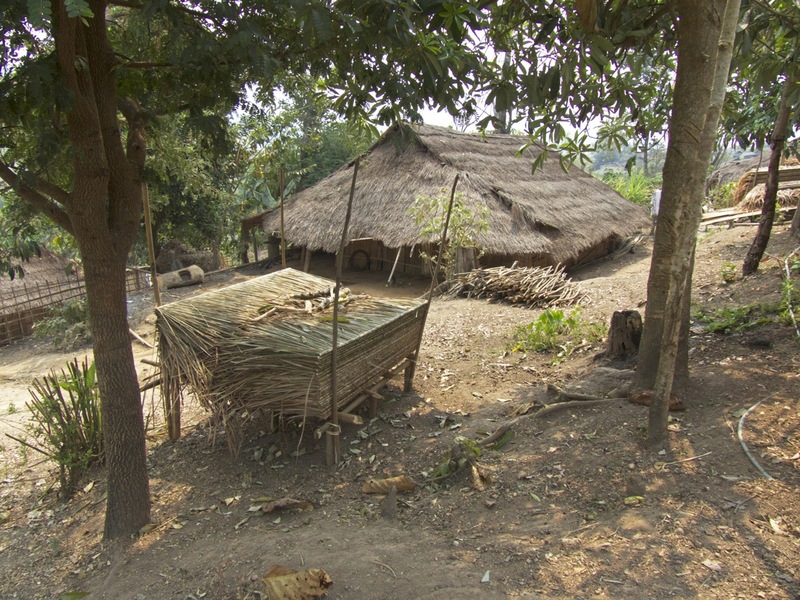 While the huts and rustic characteristics of the villages really mean these villages have very little money it was a pleasure for us to interact with villagers relatively unspoiled by tourism. Each time we know that we have shared a special moment in time together; many of these villages and the customs of the people who live in them will be gone, never to be experienced again, in a very short time. As the days passed in Tha Ton we watched, with increasing dismay, the number of fires being lit very close to our hotel and in the nearby fields. I looked into this a bit and discovered that the amount of pollution being generated each year is increasing. At times becoming so bad that it is life threatening for some people. 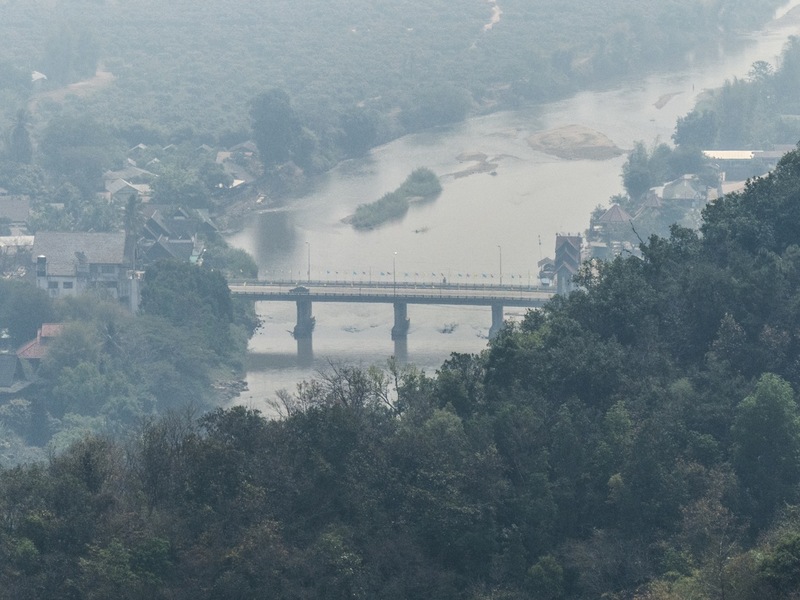 Four flights from Bangkok to Chiang Mai were turned back due to poor visibility that week alone. 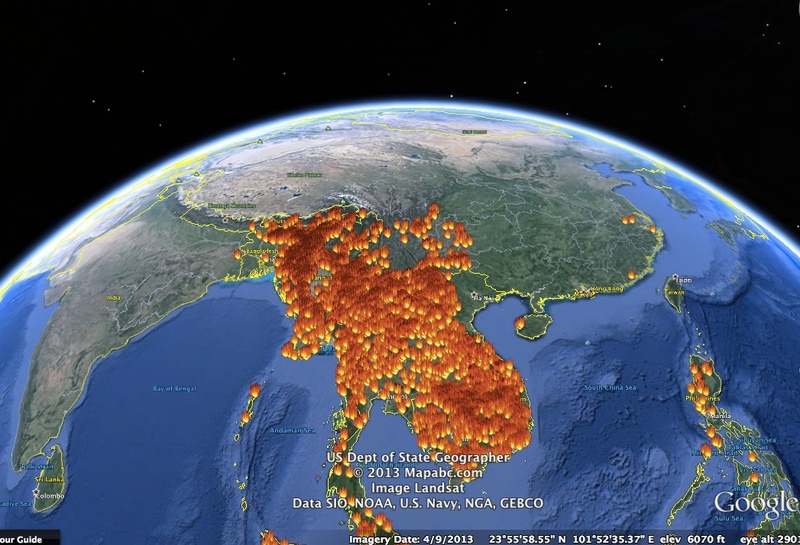 I found a website and downloaded a map for google earth (https://earthdata.nasa.gov/data/near-real-time-data/firms/active-fire-data) that shows the number of fires lit during one 24 hour period during our week in Tha Ton. A very dramatic picture of the extent of the burning. There are efforts to teach the local people to learn to plant fruit trees rather then practice their current slash and burn agriculture but it seems a huge almost impossible task to me. These burning techniques have been used for generations. The population growth and ever increasing need for more space for crops is adding to the problem. We had several close encounters with fire ourselves. One night during dinner we noticed a large fire burning on the hill about 300 feet from our hotel. We ran to get the camera and watched in amazement wondering if the fire was really controlled. 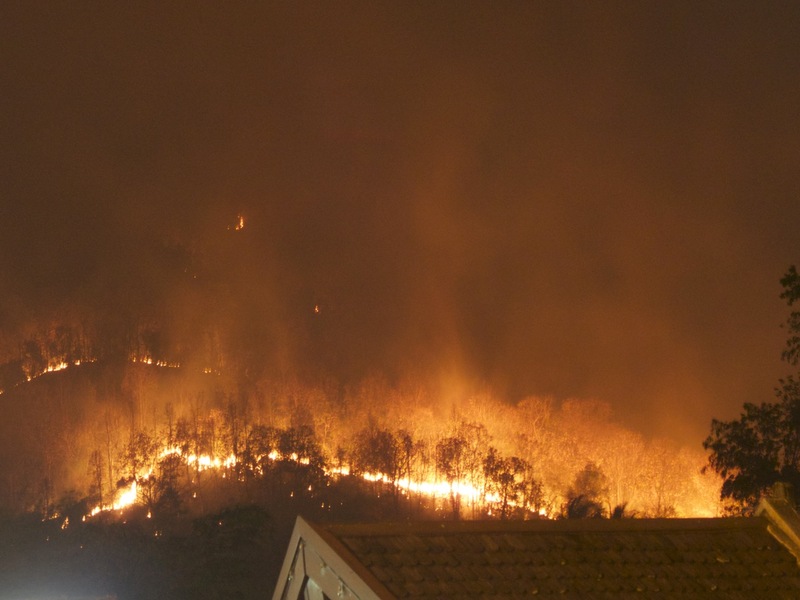 The fire was quickly spreading down and around the hill. Yet there must have been a fire break as it only burned down to a specific line. On another day we could see a fire burning near the city. We were both interested in learning more about what the locals were doing and decided to get a closer look. We walked up the hill following the cloud of smoke. As we approached the fire I heard a loud crackling noise. It sounded like a large camp fire complete with the swooshing fire noise and the popping and bursting sounds of wood. 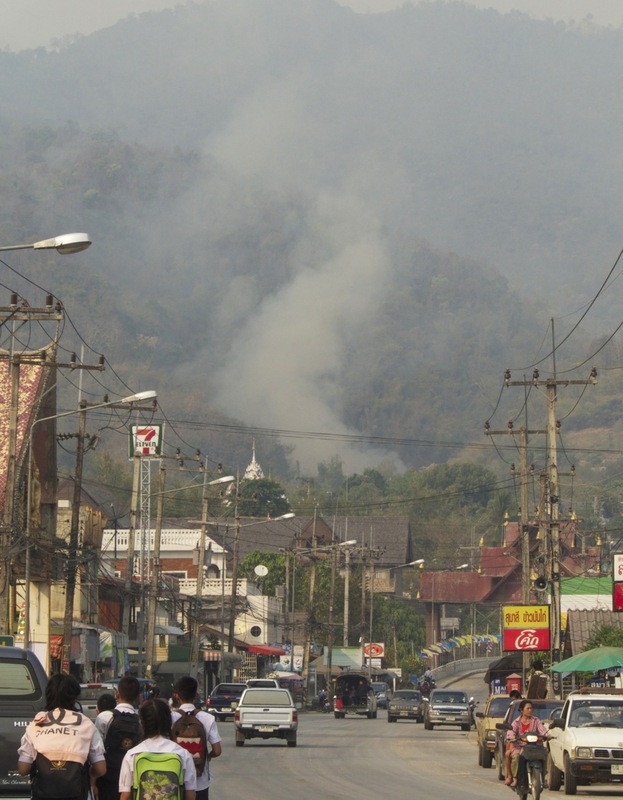 The smoke was very thick but I could still see the line of fire at the top of the hill. I watched in amazement as, in a few seconds, the fingers of fire crawled toward us as it moved down the hill and I could feel the intense heat. So much stronger then a camp fire. Michel was busy with his photographs and I called out to him as I could tell the fire would reach the place he stood very quickly. At that moment two local kids drove up from the town on a motorcycle. They paused for a moment and then drove up the little path, disappearing into the smoke. Seconds later the area they had driven through was covered with flame. Michel and I both looked at each other in amazement and wondered where they had gone. Where were the people who started this fire? Who would stop the fire from continuing on down the hill into the village? We’ll never know the answers to those questions as neither one of us where enjoying the almost overwhelming smoke at this point. We walked back down the hill, less then a kilometer to our guesthouse. 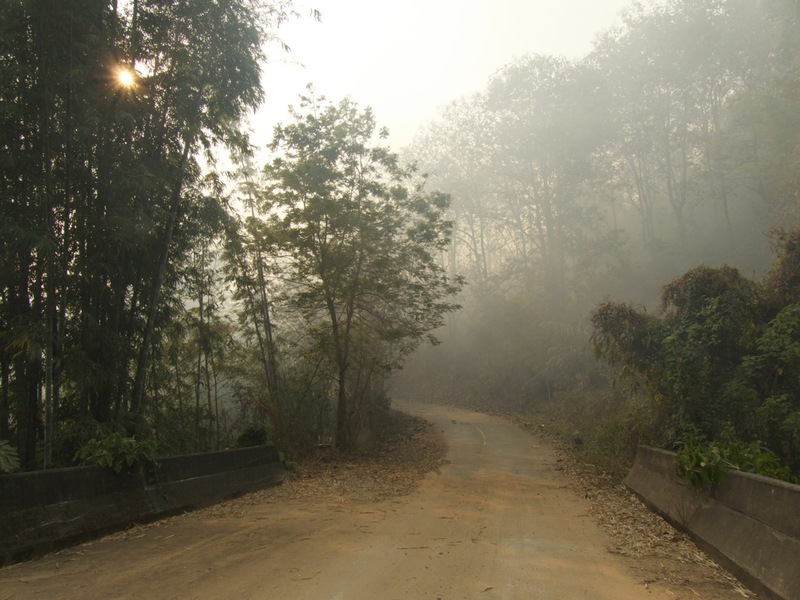 We stayed in Tha Ton for almost a week and during that time decided our plan to go further north into Laos was a bad idea. We were told that the number of fires would increase during April and air quality would not improve. 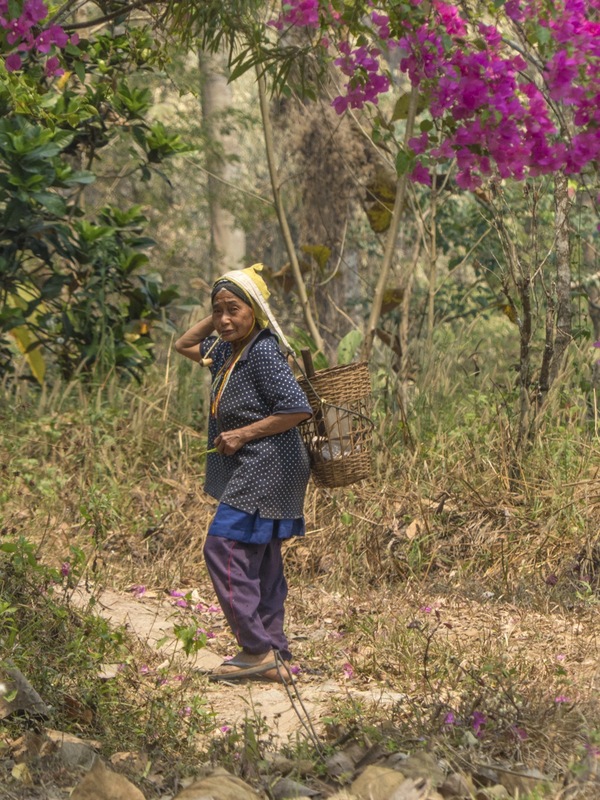 We packed our bags and headed south to the sea breeze of our beloved Kampot in Cambodia. je vous embrasse fort et vous accompagne pour toutes vos aventurues ! j’adore jouer avec le feu surtout quand il s’agit du feu aux fesses….? otut est fabuleux, souvines toi de nos experiences communes. 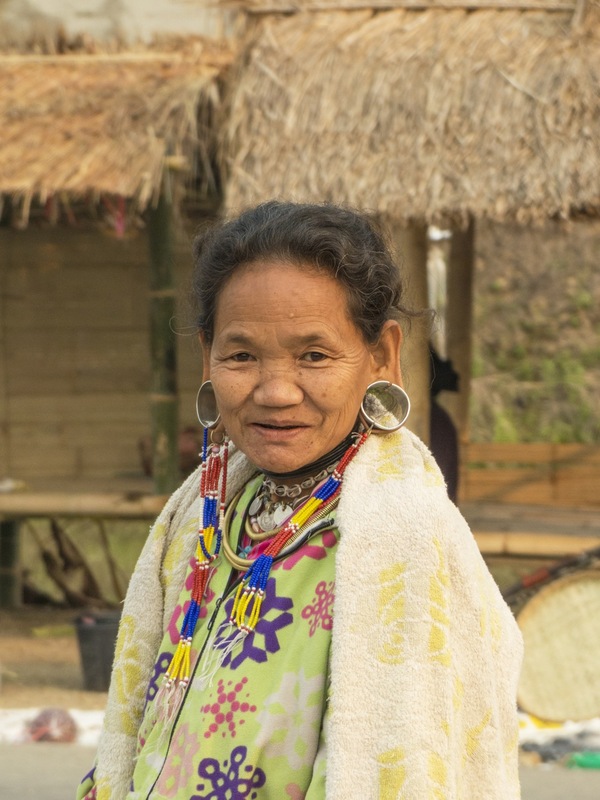 How wonderful to capture pictures of the tribal women and their dress. Loved your blog! Stay safe! Love you! We are on our weekly family call and missing you! Thanks Claire and Michel for another great blog post. Amazing diversity of people you meet. I hope they find a way to keep the core of their culture as they are swept up in modernity. Great that you get to meet them and they get to met you! Miss you. Enjoy the Kampot pepper! so wonderful! me and my husband are going there this month. do you know what time the market opens? so finally where did you rent the motorcicle? thanks for your info. We think it was at the Garden Home Hotel….over the bridge and left on the first little road. If you stay at Sappaya Guesthouse Suni will help you and I am pretty sure that the other hotels will help as well. The market starts very early probably around day break and was over by 10 am. Enjoy!